Regulatory T cells (Treg) have a central role in controlling the activation of self-reactive T cells and maintaining peripheral tolerance in our body. Many effector mechanisms for Treg function have been described including a role for the protein CTLA-4 which is constitutively expressed by these cells. Despite its importance, there is currently little consensus in the methods and protocols for studying CTLA-4 function, which is partially due to debate over CTLA-4 function itself. In this chapter, we outline protocols used in our lab to study CTLA-4 function, which have been generated based on the observation that CTLA-4 acts to physically remove and degrade its ligands expressed by antigen presenting cells. Accordingly, we provide protocols for isolation of human monocytes and their differentiation into dendritic cells (DC), purification of conventional and regulatory T-cell populations, and the assembly of CTLA-4-dependent Treg suppression assays. We hope that this will offer a reliable platform for dissecting the biology of CTLA-4 on Treg and for testing reagents aimed at modulating CTLA-4 function. 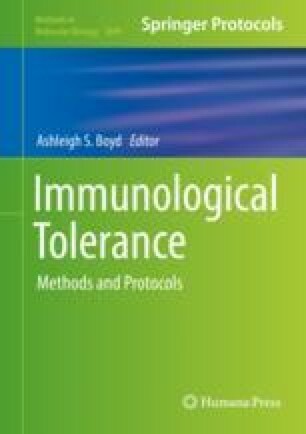 Such assays are increasingly vital for the study of immune function in both healthy individuals and patients with a variety of autoimmune and immune dysregulation syndromes. TZH was funded by the Wellcome Trust.